Hello and welcome to my own personal domain. Feel free to browse and look around. See anything you like, don't like? Let me know. Thanks very much for visiting and stop by soon! 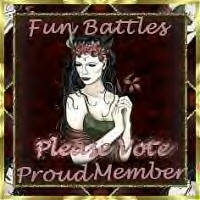 And before you go, please sign my guestbook and vote for me on Fun Battles! Thanks! "Who is this girl and why does she have her own website?" Know more about me here. Look at my new online photo album filled with pictures of my family, friends, and recent events. MTV, the library, San Francisco Giants, and Apolo Anton Ohno are just a few of my many interests. More of my interests and related links here. Flower background courtesy of Pat's Web Graphics.